News arrives that Felix is in trouble and later Antonius is arrested. Through the Bible stories of Jesus washing the Disciples feet, Jesus and the Lepers and the Last Supper and Jesus Arrest, we learn the importance of humility. Macky finally decides he must leave Rome. Now Portia must decide what she wants her future to be! We hear the Bible stories of Jesus being seen on the road to Emmaus, the Rich Young Man and the Ten Commandments, reminding us to make good choices in life. 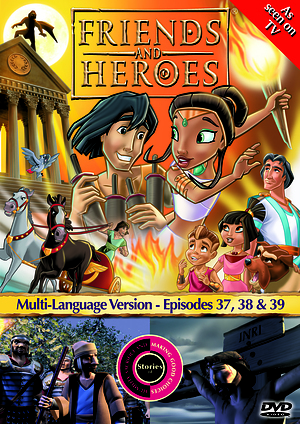 Friends and Heroes Episode 37-39 by Friends and Heroes was published by Friends and Heroes in June 2012 and is our 4605th best seller. The ISBN for Friends and Heroes Episode 37-39 is 5051347430185. Be the first to review Friends and Heroes Episode 37-39! Got a question? No problem! Just click here to ask us about Friends and Heroes Episode 37-39.